The first week of the 2016 season of college football is finally over. It was an incredible weekend that saw four teams in the top-11 go down. There were epic overtime thrillers and games that were completely lopsided. Some teams came out of the gates looking like real contenders and others flopped hard. While there is a long way to go on the year, there is reason to overreact to things and make bold assumptions. That's what makes college football such a fun sport to watch. Let's just call it like it is, it's going to be hard for anything to top Texas and Notre Dame. It fit all the criteria of a classic. It had big plays, insane plays and improbable moments that left fans in disbelief. How often does a blocked extra point get returned for two points and force overtime? Even more importantly, it helped establish a couple narratives that will follow the two teams for the rest of the season. The first narrative being is that Notre Dame is going to have to rectify their quarterback situation soon. Brian Kelly went into the first game with a tough decision on his hands and came away with a loss because of it. It is clear that the man who should run the Irish under center is DeShone Kizer. He became an instant start with his play against Texas and had Notre Dame played him from the beginning, they likely win the game. 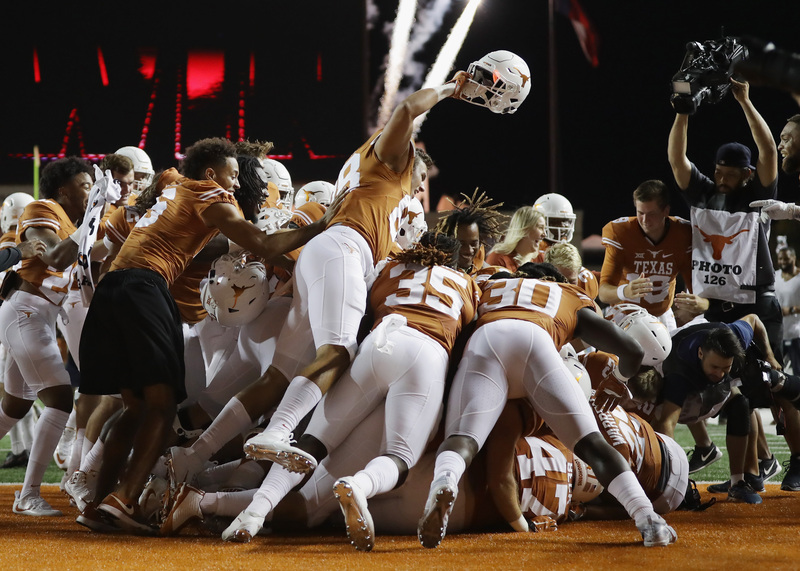 As for Texas, Sunday night was more than a huge win at home. It was a return to prominence for the Longhorns. The program is a real threat to win the Big-12 this season and they already have a leg up with Oklahoma losing. Shane Buechele did quite the job at quarterback in his debut in the team's two-quarterback system. They have the talent to be a great team and they have slowly put the pieces together dating back to last season. The Longhorns are for real. The Pac-12 is in serious trouble. In fact, one should probably start lowering the lifeboats, because this ship is about to sink. The conference missed the playoffs last season and if there was smart money to bet, it's that they will miss it again this season. Over the weekend, the conference had a pretty bad start. While Stanford won, there was nothing exactly jumping off the page from their victory. Down in the South, the two presumed favorites in USC and UCLA were heavily exposed. It's the second year in a row that a Pac-12 South team scheduled an SEC West opponent and watch things go south in a hurry. It happened to Arizona State, a favorite of many, last season. While UCLA can hang their hat on a tough overtime loss, the Trojans got absolutely embarrassed on national television. Neither team is going to be making the playoffs this season and their one loss has put them on the brink already. Now, both could certainly go on a run, but neither program has shown the consistency recently to show that they will. So it's Stanford or bust, unless Washington or Oregon wants to prove they are for real. Washington State once again lost to an FCS school to begin the season and one has to wonder what exactly is going on with Mike Leach's program. This program is not in a good spot right now and one has to wonder if it has to get worse before it gets better. Alabama didn't make many mistakes on Saturday night, but they did make one big one. That mistake was not starting Jalen Hurts at quarterback to begin the game. Luckily, he did find his way into the game and a star was born in Dallas. In just one blowout win over the Trojans, Hurts looks like the next coming of Cam Newton or Vince Young in college football. He was impossible for the Trojans to bring down because of his size and speed. Add in the fact that he has an absolute cannon for an arm and Hurts is going to take college football by storm. He's already developed a major connection with ArDarius Stewart and that's going to carry the team this year. Once he learns to find Calvin Ridley on the field, the team's offense will take off to the next level. Hurts is a freshman and he's the real deal. With more seasoning and games under his belt, his legend will continue to grow. Having a game like he did against USC under the spotlight will help him once the Crimson Tide begin conference play. With Hurts under center for a while, the Tide are going to continue to roll over their opponents. While it's lofty praise to compare him to two National Champions after one game, he is playing for the best program in the nation. He has all the tools and the platform to be the best quarterback in college football. It's going to be quite the ride for everyone in Alabama. One of the best stories of the 2015 season was the way the LSU players rallied around Les Miles. After the program was going to make a hasty decision and get rid of their coach, the outpouring of support allowed Miles to keep his job as head coach of the Tigers. That's only going to go so far for Miles now. After coming into the season with high expectations of making the playoffs, the Tigers have no margin for error after one week. The team lost on the road to a Wisconsin team wasn't ranked. While Wisconsin clearly should be a ranked football team, the Tigers were No. 5 in the nation and can't lose a game like that if they're going to make the playoffs. Now, they have to go through the arduous task of running the table the rest of the way. That means they can't afford to slip up and lose a second game. If they do that, then they can kiss their playoff hopes goodbye. Their chances of getting there are tough and the minute they lose their next game if they do, the chatter about Miles is only going to heat up again if it hasn't already. He had a great story of a team rallying around him last year, but he can't afford to carry those same results into this year. The team needs to play like a top team soon or he won't be the coach of the Tigers much longer. The Big Ten is going to get a team into the playoff again this season. They might even get two if they're strong enough as they showed the first week. One thing is clear, the Ohio State Buckeyes and Michigan Wolverines are on a collision course that will culminate in a trip to the College Football Playoff. Neither team came out letting off the gas in their battles against inferior opponents. Both put the foot down and showed the strength of their programs. It's a testament to the work of Urban Meyer and Jim Harbaugh. Each of these coaches have revitalized their program and have turned them into teams that have a real shot at winning it all. Everyone knows that Michigan and Ohio State is one of the biggest rivalries in college football. If they meet at the end of the season with real implications on the line, then it's going to be incredible football. These two programs hate each other with a passion and each would love to get a leg up on the other with a victory over the other. The team that does win will roll in the conference title game. This moment has been coming for a long time for these two. The game will take place in Columbus and quite frankly, it can't get here soon enough. Penn State hired James Franklin away from Vanderbilt in 2014 after their former head coach, Bill O’Brien, left the college ranks behind to become the head coach of the Houston Texans. Judging by the hefty contract he received, the Penn State administration thinks extremely highly of Franklin’s abilities as a football coach. In his two seasons of guiding the Nittany Lions, Franklin has posted a 14-12 overall record with two bowl game appearances. More importantly though, he has helped revive the program and started convincing big-time recruits that the future is bright in State College, Penn. Dabo Swinney is hands down one of the most polarizing personalities in all of college football. And it just so happens that he is an excellent coach, too. Since being promoted to the full-time head coach at Clemson in 2009, Swinney has led the Tigers to an overall record of 71-24, two ACC titles, and an appearance in the 2015 College Football Playoff National Championship Game. As a result, Clemson rewarded Swinney with a contract extension this spring that makes him one of the highest-paid college football coaches in the country. When Hugh Freeze took over at Ole Miss in 2012, he inherited a program that was coming off of a disastrous 2-10 season in 2011. He was able to quickly turn things around in Oxford, Miss., going 7-6 in his first year on the job. In the three seasons after that, he’s led the Rebels to a 27-12 record. He has guided the program to bowl games in every year he has held the job, and he was rewarded with a contract extension this January. Looking forward, 2016 has a chance to be a special season (barring any NCAA sanctions following Laramy Tunsil’s draft day meltdown) for the Rebels with a Heisman Trophy candidate under center in Chad Kelly. Texas A&M hired Kevin Sumlin away from the University of Houston in 2012, and the 51-year-old coach instantly turned the Aggies into one of the most exciting teams in the country to watch. Under Sumlin, Texas A&M has emerged as an offensive juggernaut and a place where NFL scouts go to find high-quality talent. With that being said, Sumlin will undoubtedly start to feel the heat if the Aggies do not improve in the win/loss column in 2016. Texas hired Charlie Strong away from Louisville to take over for longtime head coach Mack Brown back in 2014. At the time of his hiring, Strong was one of the fastest rising coaches in the business, but his time in Austin hasn’t exactly gone as planned. To be fair, Strong did go in and clean house during his first two seasons on the job. Nevertheless, his two-year record at Texas is 11-14, which means that he is firmly entrenched in the hot seat entering the 2016 season. Taking over for a legend is never an easy task, but Jimbo Fisher has made it look extremely easy. Since taking over for Bobby Bowden in 2010, Fisher has led the Seminoles to a 68-14 overall record, three ACC titles, one national title, and one appearance in the College Football Playoff. Knowing this, it should come as no surprise that the 50-year-old coach is among the highest-paid coaches in the country. His recently signed contract extension runs through the 2022 season and could be worth as much as $44 million in total. Bob Stoops is currently tied with Kirk Ferentz of Iowa as the longest tenured Football Bowl Subdivision head coaches in the country. In his 17 seasons on the job at Oklahoma, Stoops has put together a Hall of Fame-caliber career. With a career record of 179-46, Stoops has led the Sooners to nine Big 12 championships and one national championship, won multiple Coach of the Year awards, coached two Heisman Trophy winners, and led his teams to bowl games in every season he has held the position. With a resume like that, it’s no wonder that Stoops is one of the most handsomely paid coaches in college football history. Very few coaches have ever achieved the kind of success Urban Meyer has enjoyed over the course of his career. Every program he has been in charge of has reached new heights under his guidance, and he has proven to be one of the best in the business when it comes to developing NFL-caliber talent. Since taking over at The Ohio State University in 2012, all Meyer has done is lead the Buckeyes to a 50-4 overall record, one national title, one Big Ten title, and three New Year’s Day bowl games. He is one of the highest-paid coaches in college football, and he has been worth every penny to Ohio State. Simply put, Jim Harbaugh is unlike any other coach in college football. He has a huge personality, does things his own way, and demands excellence out of his players and his coaching staff. More notably, though, he is a flat-out winner. In just one year, Harbaugh has taken Michigan from being a mediocre team in the Big Ten to a legitimate national title contender and a force to be reckoned with on the recruiting trail. For Michigan, landing Harbuagh wasn’t cheap — despite the fact that he played quarterback in Ann Arbor from 1983–86. But when it comes down to it, he has already proven to be well worth his enormous contract. The bottom line here is that Nick Saban is the gold standard in today’s college football coaching landscape. Back in 2007, he took over a dormant Alabama program and has since turned the Crimson Tide into a bona fide college football dynasty. Saban’s program is currently on one of the greatest runs in college football history, posting a 105-18 overall record with four national titles, four SEC titles, and two Heisman Trophy winners in nine years. Needless to say, Alabama has seen and incredible return on their massive investment in Saban.